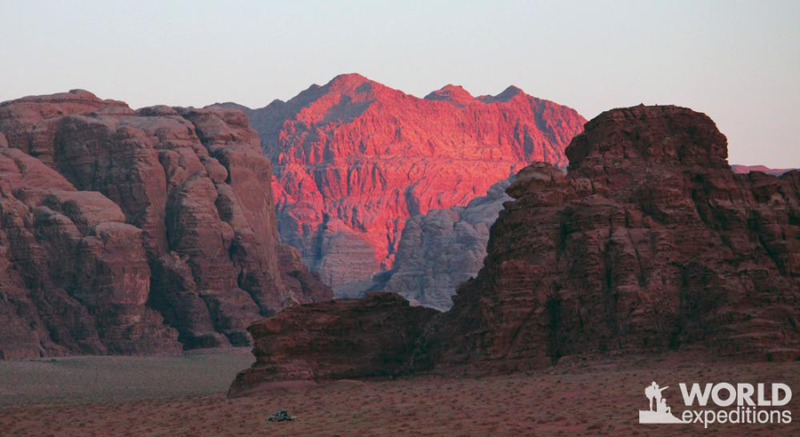 Jordan's wilderness is astonishing and the best way to fully appreciate this biblical land is on foot. The route from Dana to Petra is considered to be one of the finest multi-day hikes in the Middle East. With World Expeditions' experienced local guide and Bedouin crew we trek from Dana Nature Reserve through remote canyons and alongside near-vertical gorges, enjoying wilderness camping in breathtaking wadis (or oases). The trek has been dubbed the "Inca Trail of the Middle East" and your first view of Petra's Monastery evokes similar feelings of awe when arriving on foot at one of the world's great wonders. We climb to the famous rock arch at Burdah Bridge and trek through the rugged Rakebak Canyon. The finest sunset will tantalise you with its spectacular colours! We return to Amman via the Red Sea coast, with a swim in the Dead Sea to round off this amazing adventure. For the trip grading and a detailed description of this 11-day holiday, please visit our website.